Being vegan enticed me with assurances of glowing health and vitality, but it wasn't the joyful, cleansing experience I thought it would be. Despite carefully sticking to various gluten-free, vegan diets conceived by my doctor and dietitian, I had no energy and I got sick a lot. My blood sugar levels went crazy, and my pre-diabetic condition worsened. I tried for three years until the doctor told me to stop. I sold my copy of No Impact Man, silently cursing Colin Beavan for saying this was a good idea. Recently, inexplicably, I decided to give it another shot. Maybe it was a guilty conscience, or vanity, who knows. I grew up seeing baby cow cages on front lawns in Ohio and studied environmental science in college. Still, I wouldn't be vegan if consuming moderate amounts of meat and dairy was essential for health. Sustainability is important, but I'm unapologetically anthropocentric when it comes to my own welfare. Turns out, soy was the culprit, so it didn't help. * My skin erupted, my meat-induced digestion issues returned, and my energy levels dropped. Granted, I'm not about to throw away secondhand leather. I'll continue wearing cruelty free alpaca and thrift shop wool. Oil extraction and the new clothing industry are responsible for both human and animal exploitation, so why continue the cycle when perfectly useful garments exist secondhand? The point is to be balanced and conscientious without judging others. It's no secret I hate bulk bins. Zero-waste shopping doesn't depend on them- zucchini, potatoes, cauliflower, chickpeas, almonds, yams, and cabbage stand in for meat, pasta, flours, and rice. 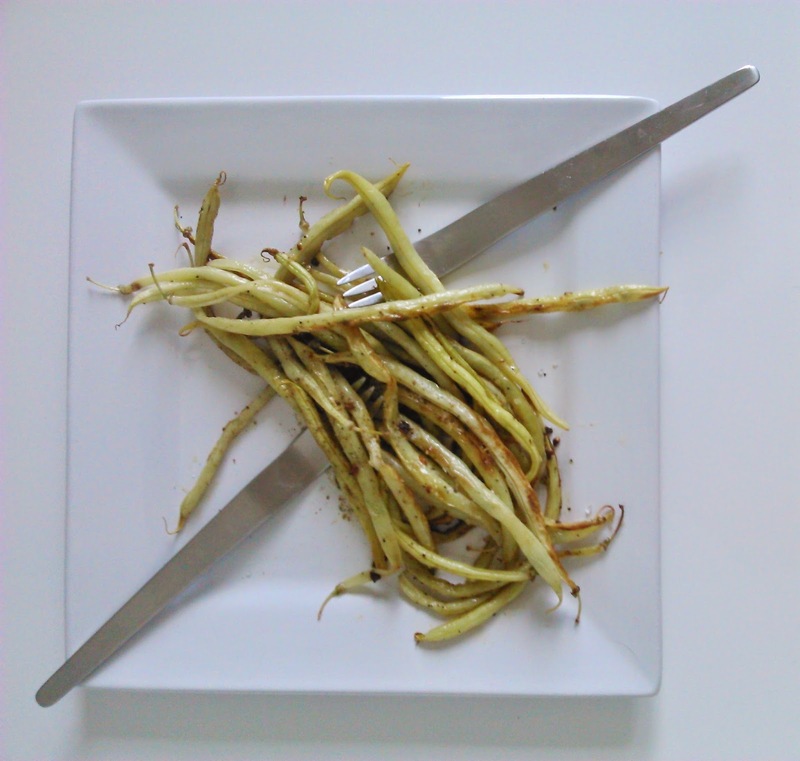 In Paris, dried foods (packaged or unpackaged) risk gluten contamination; fortunately, fresh beans and unshelled nuts are available at many markets, or in non-BPA lined reusable glass containers. Dark leafy vegetables, legumes, and root vegetables comprise the bulk of my diet, along with coconuts, avocados, olive oil, and whatever fruit is in season. Hummus and avocado are satisfying cheese and mayonnaise replacements, especially when ladled over falafel. I buy more recyclables than before, like gluten-free chia, hemp, and superfruits packaged in plastic-free paper at La Vie Claire, or buckwheat pasta my husband found in compostable cardboard. If that's too much packaging for you, the bulk selection at Causses (goji berries, olives, raw almonds, dehydrated chips) never makes me sick. Vegans unencumbered by a laundry list of intolerances can purchase fresh soybeans there. For a homemade sugar / honey substitute, bake pitted dates 10 minutes in a 225° C oven, then grind with mortar and pestle. Alternately, simmer equal parts dried or fresh fruit and water in a covered saucepan for 15 minutes and grind. If you have time, raw vegan date syrup looks easy, healthy, and doesn't require a blender. I could still turn into Moses Martin, but right now, I have more energy and clearer skin. My stomach doesn't hurt, and my husband complimented me for being frugal. I promised forever ago I would post pictures of the food I eat. Presentation isn't my forte, so excuse the Pinterest fail photos. On a typical day, I might eat one avocado, one pumpkin, one pineapple, 500g beans, 500g leafy greens, 200g hummus, three beets, an entire botte of carrots or radishes, one zucchini, a whole head of cauliflower or broccoli, five peaches... you get the idea. Curries, chili, ratatouille, whole roasted vegetables, and coconut-based soups are quick, easy, and satisfying on cold days; otherwise, I copy grain-free meals from Shizen.fr and Mango and Salt. Let me know if you want the recipe for anything, but they're mostly self-explanatory. Just chop, roast, bake, steam, eat! 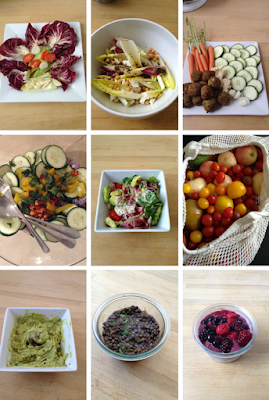 Clockwise from top: Chicory and avocado salad, endive salad, falafel, cauliflower pizza, salad, tandoori roasted cauliflower, coconut ice cream with stewed rhubarb, veggie chili, sweet potato and vegetable plate, salads, tomatoes and apples, buckwheat pasta with sweet potato, beet and hummus salad, cauliflower green curry, sweet potato kale burgers, homemade coconut milk and kombucha, goji berries with coconut and oats, guac, lentil salad, chia pudding with beetroot, salad, beets and sweet potatoes, coriander lime coconut chickpea salad, cabbage salad, salad, and stir-fry. Above: Mango, blackberry, and mint salad; butter beans with lemon, onions, and garlic. Not pictured: Most of the fruit / nuts I ate and all of the juices. I visit VeganMania for toothbrushes, hairbrushes, and unpackaged soap; Causses, La Vie Claire, Epicerie Generale, La tête dans les olives, and street markets for food; Le Cairn for gluten-free, vegan treats and juices. Click here for a map of gluten-free, vegan restaurants in Paris. *I do NOT advocate giving up any food- especially gluten- unless medically necessary, because it's often difficult to reincorporate into your diet. I only changed my diet after being diagnosed with celiac disease, lactose intolerance, egg intolerance, and a soy allergy by several doctors in several countries- skin prick tests, blood tests, the balloon test, drinking barium, endoscopies, you name it, all positive :( I don't let people bring gluten into our apartment, though, because it's too hard to prevent cross-contamination. Hi Ariana, as always, thank you for such a great post.The pictures are beautiful. I wish I could find produce in such lovely colors! I wanted to ask, what do you do about nutritional supplements? For instance, how do you fulfill your vitamin B12 needs or Omega-3 fats? I'm struggling to find plastic-free supplements, and medicines. Do you have any tips on finding bulk medicines, for people who struggle with allergies or other health issues? Thank you! Hi Candace! Thank you so much! I was actually wrestling with not posting this because that's something I've struggled with too. I'm not sure there is a reliable plant source for vitamin B12, although weirdly enough, the first time I was vegan my MMA levels always tested below 250. I eat a lot of buckwheat, adzuki beans, kidney beans, shiitake, etc- all stuff with cobalt in it. I was never iodine deficient, but I wonder if I could be now that I'm in Europe, where the salt is less iodized. I don't know where to find bulk sea vegetables, but I eat a lot of strawberries, potatoes, navy beans, cranberries, etc. For Omega-3 fats I eat chia seeds, hemp seeds, mung beans, etc. Celiacs are more susceptible to being deficient in vitamin D, but I don't seem to have that problem... I guess I'm out in the sun enough? I should note, though, that I don't have allergies and typically don't get contagious illnesses, so take these with a grain of salt. Lucky me, I just get the stomach troubles! do you wash your produce before you eat it? what do you do with skins, seeds, peels, and other scraps? i'm trying to figure out what to do with the odds and ends, apart from making homemade veg broth. I haven't used onion peels for dyes yet, but I have friends who use them. What scraps do you refer to specifically? I can find more specific uses with a little more info... I don't eat bananas, but the peels are magic in a compost pile! I try not to buy things that will take a long time to compost. sorry to keep asking questions, but how do you wash your produce? can you find local avocados or goji berries in france or are they imported? I soak them in water with a splash of vinegar and then scrub. I use the water to flush the toilet after. They are usually imported (actually the avocados, you can buy local ones from Marché Bio Raspail, but you need to stop at a stall where the farmer is actually selling the produce and ask him about his practices. Sometimes it's more energy intensive than buying one from Spain or Portugal). I try to eat local wherever possible but I also recognize it's not always the most sustainable option, so I try to be flexible when it comes to eating. You just have to try and talk to the producers and see whose methods align the best with your values. How do you use mango seeds for make butter? What is the dish in the second row, fourth from right? Thanks! It's cauliflower green curry! Heat some olive oil in a pan on medium, add onions and garlic, add coconut milk, stir in some red or green curry paste (mix garlic, coriander, ginger, kaffir lime, salt, tamarind and chili), then add cauliflower and other vegetables. Bring to temperature, then turn off and let simmer. It's really easy and takes twenty minutes from start to finish. Do you make your coconut milk? Also, does your husband eat the same foods you do? Hi Stargirl! Yea, I make it, but it's not as 'milky' as storebought. I scoop the flesh out, grind it with a mortar and pestle, then stew it with water and squeeze through a cloth into a bowl. You can definitely tell it's homemade. I get the cream, yogurt, and oil from the homemade stuff. I hate breaking the coconut shell and tried desiccated coconut from the bulk bin, and the milk was smoother... but I think it made me sick with gluten contamination. I'll have to try again! My husband eats all the same foods, plus a meat dish, and then he buys lunch. He eats gluten during the day and when I'm out of town, which I'm happy about- I don't think anyone should cut out gluten-containing foods unless they have to for health reasons! I make it myself as well. I use shredded coconut in bulk, and I don't think my husband has been sick yet. Maybe it's better for GF people in the states? It's not as thick, as you said, but it doesn't have guar gum like the canned stuff. How do you make coconut oil from the coconut? That would be wonderful to make! My husband has celiac and can't have dairy, and wheat and sugar bother me. I think your gluten/meat arrangement is great. Thanks! Awe, you are the perfect wheatfree couple :) are you vegetarian / vegan as well? Actually you don't have to do anything to make coconut oil, it separates from the coconut cream and you just skim it off the top or strain the oil through a kitchen sieve ! It smells so good. I do think the States are better about avoiding cross contamination than France. I wrote New Leaf once and they said their bins weren't celiac-friendly, but I think Frontier is really careful. 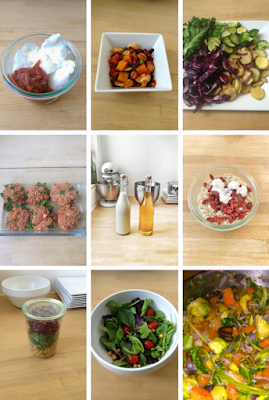 Thank you for the great food inspiration - it's inspiring to see such simple healthy meals. I have been meaning to ask you a question for a little while and seeing the last bullet point reminded me to finally do so! What do you do about dental floss? I recently went to my dentist and despite explaining all my concerns about the wastefulness of traditional floss it seems there's no escaping the fact that not flossing is going to be detrimental in the long run. Can you find the miswak unpackaged? Yes, here I can find it at Buly 1803, in Morocco I saw it unpackaged everywhere! I never shopped for it in the US though. I'd have to ask the zero waste bloggers network if they've seen it, I think many of them use one of the floss options above. Thanks Ariana I knew you'd be the one to ask! My gastroenterologist said the reason some people with gluten intolerance or celiac disease develop digestion issues with meat is not because they are intolerant to meat itself, but to the feed they use. We're not just consuming antibiotics and wheat grains, but also corn and soy. It wouldn't surprise me if you actually were not intolerant to eggs or dairy, but to what they use to feed the animals beforehand that ends up on our tables. Thank you for sharing, this is so interesting! That would explain so much! I don't know why I thought that somehow the gluten wouldn't be passed on to me as a consumer, when it's a long established fact that soy and antibiotics make it into the human system via meet. Do you know about the Hidden Soy project from WWF? Very interesting, along the same lines. Again, thank you so much for sharing. I want to do more research on this because another friend with gluten intolerance just told me the same thing- trouble with meat, dairy, etc. I ate grass fed beef mostly but I wonder if it's possible that my system is so used to rejecting the grain fed stuff, it just stopped processing meat, period. That wouldn't surprise me. Another possibility could be a tick bite, although I don't know where you would encounter a tick in Paris. Did you have the issues before moving there? I know many lactose-intolerant people can also be allergic to beef. Skin prick tests indicated meat allergy both years ago and recently, but it will take two weeks for the blood test, which will probably be inconclusive, given that I already cut it out. I just couldn't keep getting sick. Thank you so much for the inspiration Ariana! We recently made the switch to vegan, and I'm gluten free as well, and it's been tough...not to mention I'm an atrocious cook...I would guess that you don't tend to use them, but would you mind sharing some simple recipes? Hi Emily! I will try to share some, thank you for the great post idea. In the meantime, do you know the blog My New Roots? 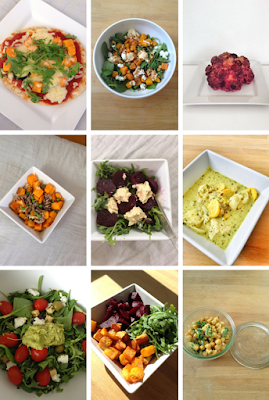 I love Instagram for recipes too, especially shizen_fr and mangoandsalt. I do! I love her site, have been following her as a dairy free vegetarian (my son can't handle dairy, hurray food intolerances), and I have her cookbook...but it's pretty complicated stuff, and my son turns his nose up at pretty much all of it, haha! The food waste makes me want to cry! Oh no! Your poor son. Well, poor you too! Ah yes, well even my husband didn't care for her sunflower risotto. The only thing he'll eat from her site is the tandoori roasted cauliflower, and I always cut out half the steps with her recipes anyway. I'm curious about her cookbook though! Would you recommend it? Ok, I will make a recipe post a priority then. This week I'm doing a weird experiment where I'm living no impact- no electricity, hot water, elevator, public transport, etc. (except, for my phone, I do need that still, and during work hours, my computer) so it's all raw foods for me and I'm afraid a post on that will not be so helpful! Aw, your son sounds too cute, but I can see your predicament! Yea I don't buy all the ingredients she uses either. I love the concept behind the recipes, I'm just terrible at following directions. I copy recipes based off the pictures she posts on Facebook and Instagram usually but I think I'm going to buy her cookbook too because the recipes are raw, delicious, and simple. I do not have a knack for presentation and I hate raw recipes that involve a lot of chopping and soaking and grinding but these have been quick so far. Oooh, Ariana, you're such a nice person! ♥ Your plates look absolutely gorgeous! Where did you find buckwheat pasta? I don't know what to feel about gluten. I did some tests. They came back negative. But each time I eat some whey-based food, it is some hard time for my belly, my skin and my mood. I don't know if it is psychological or not. Why don't you want to compost cardboard? You probably covered it before, but how do you manage to compost here in Paris? I totally get your point. I recently discovered that buckwheat is not a grain but a seed. I didn't make my mind yet but I would rather eat buckwheat pasta, as corn and white rice pasta are GI-high foods. I'm surprised you say that because when I had the tests, I specifically asked whether I should eat gluten-contening foods or not and they said it was unnecessary. I realize France is so late when it comes to allergies (and bulk, ahah). Do you mind me to ask where you were tested and how much it cost you? Glad you are trying out the vegan lifestyle, as you pretty much can't call yourself an environmentalist without being vegan! Don't replace pasta with spiraled vegetables... Vegetables should be 'sprinkled' on top of your dishes as 'decorations'. Pasta, rice, potatoes, and other gluten-free grains (I know you're Celiac) should be the bulk of your meals. You NEED to eat more calories - at least 2,000 as an adult woman (and more if you are active). Replacing powerhouse, starchy foods with spiraled vegetables will leave you weak and grumpy, which you said you've experienced in the past when trying to go vegan.... Your plates/pics are absolutely beautiful, but girl... I'm eating like 4 to 5 times that amount at each meal. And I'm losing weight! Seriously, up your calories, otherwise your body will not get the nutrients or energy it needs - this is one of the number one reasons people fail on a vegan diet. Look up HCLF vegan. Check out these channels on YouTube: That Vegan Couple, High Carb Hannah, and Legit Nutrition Hawaii. You need to eat more. No, don't fear gaining weight. Eat more, eat more, eat more... You'll feel 500 times better. Best of luck! Btw, this is coming from a place of love! I've been vegan for a while and seem to have similar health issues and learning these things has really helped me. I hope you find a good balance! Hi! Thanks for the recommendations :) I will look up those channels. You're very sweet! Don't worry I eat much more than this, these were just for the pictures! The only thing is with my celiac I have other food sensitivities, so I can't eat rice very much, I can't eat corn at all, and I can't eat much quinoa. The first time I went vegan years ago, I had blood sugar problems caused by rice and tested allergic to corn and quinoa so my doctors and dietitians on both continents told me to stay away from them. I eat lots of potatoes and make my own pastas though, especially gnocchi and tortellini! Sometimes I have quinoa but I always have trouble digesting it still. I don't even weigh myself lol. I'm just impressed at how hard my nails are and how long my hair has grown since going vegan!